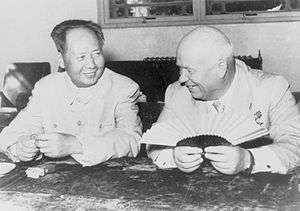 Mao Zedong (left) and Nikita Khrushchev (right). Khrushchevism was a form of Marxism-Leninism which consisted of the theories and policies of Nikita Khrushchev and his administration in the Soviet Union. Mao Zedong recognized "Khrushchevism" as a distinct ideology, initially from a positive perspective, though later the term was used by the Chinese Communists as a term of derision against the politics of the Soviet Union. Khrushchevism involves the rejection of Stalinism and particularly represents a movement away from Stalinist politics, including advocating a more liberal tolerance of some cultural dissent and deviance, a more welcoming international relations policy and attitude towards foreigners, and a repudiation of Stalinist arbitrariness and terror tactics. Khrushchevism was not only a phenomenon in the Soviet Union; Khrushchevism was initially admired in China and Mao Zedong sought to model the Chinese Marxist-Leninist state upon principles developed by Khrushchevism; however, disputes with the Soviet Union later ended friendly relations between Mao and Khrushchev. ↑ Robert F. Miller, Ferenc Féhér. Khrushchev and the communist world. Kent, England, UK; Fyshwick, Australia: Croom Helm Ltd., 1984. Pp. 1-5. Describes the term "Khrushchevism"
↑ Jeremy Smith. Khrushchevism after Khrushchev: The rise of national interest in the Eastern Bloc by Katalin Miklossy, Khrushchev in the Kremlin: policy and government in the Soviet Union, 1953-1964. Oxon, England, UK; New York, New York, USA: Routledge, 2011. Pp. 150. ↑ Robert F. Miller, Ferenc Féhér. Khrushchev and the communist world. Kent, England, UK; Fyshwick, Australia: Croom Helm Ltd., 1984. Pp. 6-8. ↑ Franz Schurmann. Ideology and Organization in Communist China. 2nd edition. Berkeley and Los Angeles, California, USA: University of California Press; London, England, UK: Cambridge University Press, 1968. Pp. 33. Shows the later use by the Chinese Communists of "Khrushchevism" as a term of derision. ↑ Robert F. Miller, Ferenc Féhér. Khrushchev and the communist world. Kent, England, UK; Fyshwick, Australia: Croom Helm Ltd., 1984. Pp. 5.